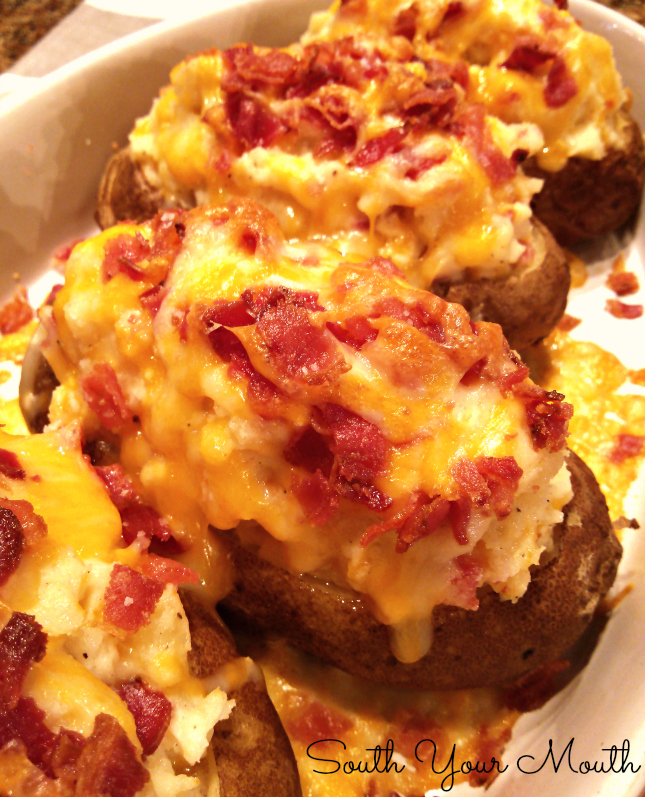 Twice Baked Potato recipe mounded mile-high with cream cheese, butter, bacon and cheese! So, my chives are gone. Like, gone. As in, they were in a pot on my back deck and… now they’re not. The whole pot is gone. I think it was the fairies. Remember that giganto rosemary bush I used to have? The one Husband finally made me get rid of because it was the size of a Christmas tree? I was always fascinated with that thing. If I were a kid, I would have totally had my GI Joes and Barbies in it pretending to be the Swiss Family Robinson or the Rats of Nimh. I always imagined fairies lived in it. Seriously. It was that fantastically enchanting. Anyway, I think the fairies got mad that we hacked down their home and are paying us back. Because weird stuff keeps happening. Like the chives going missing. And someone keeps putting whole onions along the entire perimeter of our entire back fence. Oh, wait, that’s my neighbor that’s evidently gone crazy as a road lizard. That or she's a witch. Never a dull moment, folks. Never a dull moment. Back to the chives! I totally thought I had fresh chives to add to these but, again, they've gone missing. Maybe the crazy onion lady has them. Maybe I looked like the crazy lady wandering around my back yard with kitchen shears hunting my chives with a confused look on my face. But I highly suggest adding fresh chopped chives as a garnish because they would be the perfect complement! Rub potatoes with olive oil and place in a single layer in a medium-sized baking dish. Pierce the tops of the potatoes with a paring knife or fork to vent. Cover dish with aluminum foil and bake at 375 degrees for 1.5 hours or until potatoes are cooked through and tender. Test by inserting a paring knife into one of the potatoes – if it slides in easily with no resistance, it’s done. Remove potatoes from oven and let rest just until cool enough to handle. Run a sharp knife around the perimeter of the top third of the potato, removing and discarding the skin. Using a small spoon, scoop out the inside of the potato to make a little “boat”, making sure to leave about a 1/4 inch of potato around the skin for support. Reserve all potato flesh that you scoop out. In a large mixing bowl, combine reserved potato, cream cheese, butter, milk, salt, pepper, and garlic. Mix by hand or with an electric mixer until well combined. I like mine more rustic so I just mix with the paddle attachment on my stand mixer until combined (equivalent of mixing by hand) but if you like yours smooth, whip with an electric mixer until you reach your desired consistency, adding more milk as needed. Fold in half of the bacon crumbles and half of the cheese. Drizzle the bottom of your baking dish with olive oil and place potato “boats” back in the dish*. Fill potatoes with filling, mounding them “mile high” until all of the filling has been used**. Top each with remaining cheese then top with remaining bacon. Bake, uncovered, at 375 degrees for 10-15 minutes or until cheese is melted and bubbly. *If you like potato skins like I do (seriously, I think it’s the best part! ), drizzle olive oil all over the empty “boats” before you fill them (on the skins and inside) then sprinkle all over with kosher salt and fresh cracked black pepper. That way, when you get down to the skins, everything's already moist and seasoned. Yummmm! **If your filling isn't warm to the touch at this point, cover dish loosely with foil and bake for 5-10 minutes at 375 degrees or until filling is warm again. Then top with remaining cheese and bacon and following baking instructions above.